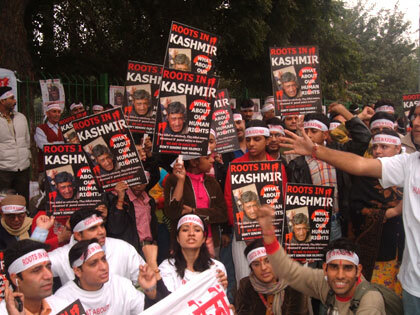 Kashmiri Pandits in refugee camps across the country erupted in spontaneous celebration at the news of a coalition agreement between the Bharatiya Janata Party (BJP) and Mufti Muhammad Sayeed’s Peoples Democratic Party (PDP). “Mufti Sahib will no doubt look take care of our interests as effectively as he did as Union Home Minister in 1990,” said Govind Kaul of Panun Kashmir, an organisation representing Kashmiri Pandits. The BJP’s ideological allies expressed joy at the party’s deft political manoeuvres. The Rashtriya Swayamsevak Sangh journal Organiser contended that the alliance with the PDP was necessary to foil a “vicious self-rule” plan by Mufti Sayeed and his daughter Mehbooba “that aims at weakening state’s links with rest of country and ultimately realising the dream of an independent Kashmir”. eis Batte ti chi tsotal. Akh ne traavaan vote… beiy tsandaan panun Kashmir!